Perhaps no one in this small northern New England town has more credentials when it comes to early snowmobiling than Lancaster’s own Paul T. Crane. Paul may very well be the very first person to ride a “modern day” snowmobile. Let me explain the term, “modern day.” There were many different designs and variations of motorized snow travel over a wide span starting as early as the late 1800’s. But by the mid-1950’s most designs had settled on those such as the early Polaris and Arctic Cats, where the engine was in the rear over the track and the rider sat in front on a separate unit over the front skis. They were quite large and cumbersome at first, but almost all had reverse and served their customers well. Many were used by farmers and loggers for work-related tasks. Some became useful by conservation officers to navigate the deep back woods that would otherwise take days by snowshoe. But soon, a different design would emerge that would not only forever change motorized snow travel, but change how we looked at the snowmobile beyond a mere work horse, the invention of the “modern day” snowmobile. The town of Lancaster will become the first place in the United States to witness this revolution for which we can thank two gentlemen. Here is the story of one of them. In 1958, a young businessman from Maine came to town looking for as close to an ideal location as possible for his new company, Timberland Machines, Inc. After much searching that involved several communities, Mr. Robert Bottoms decided on Lancaster, N.H. as the new home base for his logging distributorship and he rented the old Schurman Motors building on Park Street . Amongst the many items this company had to offer loggers, one was the line of Bombardier track vehicles designed to extract pulp and logs from the woods. They utilized rubber tires and heavy conveyor belt/steel cleat tracks, rather than the all steel, expensive-to-maintain track system of a bulldozer. Bottoms hired 20- year-old Paul T. Crane as his first employee. Paul stated years later, “I don’t quite know why he hired me, a young man with little experience, but there I was.” Bob and Paul went into some hellish places in the beginning, trying to get those stubborn loggers into using the unfamiliar tiny Bombardiers, especially after being used to using huge bulldozers, but as a few tried them out and liked them, more came on board. Timberland was soon getting a foothold into the lucrative woods business of the late 1950’s. Paul, Bob’s lone salesman, went on the road full time in a 1959 Chevy station wagon into Vermont, New Hampshire and Maine. Bob and Paul sold HDW Bombardiers to the Brown Paper Company where they were used up in Parmachenee, Maine. Paul sold J5 and hydraulic cranes used on pulp trucks. Paul and Bob both sold Muskegs to various ski areas for construction and grooming purposes. A phone call from inventor J. Armand Bombardier sometime in late 1958 or early 1959 would prove to be not only one of Timberland Machines’ most important calls, but it will become a life changer for young Paul Crane. It had to do with a new invention that Bombardier had been playing around with and that was this little track vehicle he called a “Ski-Dog.” He wanted Bottoms to come to Valcourt, Quebec to check it out. “So off we went to Canada one morning in Bob’s 1958 Ford station wagon,” Paul says, “to see what this thing was.” It was a prototype of a new snowmobile unlike anything either Bob or Paul had seen before. The rider actually sat over the track, with the skis and motor in front. There were running boards on both sides for the rider’s feet (which future riders would find out later helped give them the added maneuverability by allowing them to use body English when leaning from side to side). Paul Crane was given the green light that day to try it out. As Bob Bottoms and J. Armand Bombardier looked on, Paul rode it down the unpaved main street of Valcourt. “It had wheels attached to wooden skis,” Paul said, “due to lack of snow.” He goes on to say that the cab on this prototype was made of plywood, but the production machines were steel. “It had a set throttle like a lawn mower, instead of a spring loaded return,” he added. 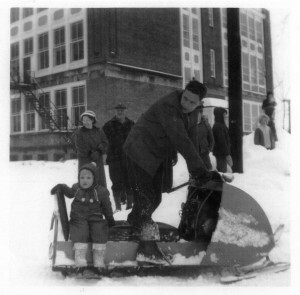 Folks, this was a test drive for the ages as he was most likely the very first American citizen to straddle the first “modern day” snowmobile, a design so perfect, it is still in use today! Strip away the long travel rear suspensions, take off the IFS long travel front ends and what you still have is the rider still sits over the track, his feel rest on running boards and the motor is up front just as it was on that 1959 Ski-Dog. A simple design that took a genius to build. In fairness to other brands (my heart still beats for Polaris), as the Bombardier design was widely accepted as the standard, it was also greatly improved upon by other manufacturers and what we have in today’s super sophisticated sleds is a direct result of years of strong competition. Paul told me that the two sleds Timberland purchased were the tenth and eleventh Ski-Dogs produced by Bombardier and the tenth one was the very first machine to enter the U.S. and Lancaster got it! 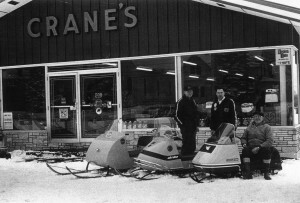 This picture, taken in 1972, features, from left to right, Robert Bottoms of Timberland Machines, Paul Crane of Crane’s Sporting Goods, and Dave Parks. Mr. 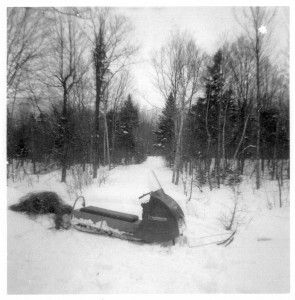 Parks bought the first Ski-Doo from Timberland in 1960. He then upgraded in 1966 for a 1966 Olympic Ski-Doo. Then in 1972, traded in his Ski-Doo, and purchased a 72 Elan. The first production Ski-Dog had a serial number of 60-12. The first one to come here had the serial number 60-22. The first nine were sold in Canada. Paul test rode the 60-22 sled before anybody else did, which also makes him the first person to ride one in the United States! In December, 1959, Robert Bottoms and Paul Crane hired Morin & Sons Trucking to go up to the Bombardier factory to pick up Bombardier parts and one 1960 Ski-Doo, Serial #60-22. Speaking of Paul, since his first ride 55 years ago and after leaving Timberland Machines, this gentleman has been quietly and methodically building perhaps one of the largest private antique and vintage snowmobile collections in the United States. He owned and operated a successful sporting goods store in Lancaster for many years. In addition to the usual items found in a well stocked sporting goods store, Paul never unlocked the front door to “Crane’s Sporting Goods” without a line of snowmobiles, which is most likely when he began saving the old trade-in sleds nobody wanted. In the service department, Paul boasted none other than Bill Doolan and Squirrel Martin, both North Country legends when it came to two-cycle engine mechanics. Over the years, he sold many top brands of snowmobiles like Rupp, Ski-Roule, Johnson, Yamaha, Polaris and ,yes, his beloved Ski-Doo. When Paul began having those prized antique snowmobiles restored, he maintained a close personal involvement in each and every one of them. Such a stickler for perfection is he that when Paul was restoring a 1972 Polaris Starfire 440 racing sled, the piping on the seat had to be gold. Many fellow restorers told him that either the piping was “white” or that even if it was gold, he’d never find it due to scarcity. But Paul just couldn’t bring himself to do the seat with white piping. “Who the heck would know, Paul,” I asked. His reply, “Me!” It took a couple of years of searching and he finally found a man who worked for Polaris that had kept a roll of, yes folks, “gold” piping! “I knew I was right and I wasn’t going to stop until I found it,” he says. Did I mention something about the first Ski-Dog ride being life changing for Paul Crane? It’s a good thing Marilyn likes snowmobiling. Oh, by the way, folks, in case you might be wondering how the old boy’s mind is these days, he told me that when he finished his historic Ski-Doo ride, he, Mr. Bombardier and Mr. Bottoms went out for lunch. “There wasn’t any restaurant in Valcourt back then, but only a house where they served a simple lunch,” Paul told me. “We went inside, where I conveyed to the counter person as best I could that I wanted a tuna fish sandwich and a coffee frappe.” “But apparently it got lost in the translation, because what I got was a chicken sandwich and a hot coffee!” How’s that for a memory, my friends? I can’t remember what I had last night. Paul Crane is still an active member of the club for which he helped form in 1964, “The Lancaster Snow Drifters” and has volunteered to serve on the “50th International Grand Prix Reunion” committee. A race that has its roots as far back as 1962 when the Jay-Cee’s helped put it on with members Bob Clark, Claude Reed and many others including, yes, if you can believe it folks, the one and only (it might be OK to call him Mr. Snowmobile by now) Mr. Paul T. Crane! Want to see what a mere five bucks will do for you? Go to “Crane’s Snowmobile Museum” on Main Street in Lancaster, N.H. and spend a few hours looking at the nicest collection of historic snowmobiles you’ll find anywhere! There are no duplicates and as an added bonus, the curator of this place has a resume of the history of the sport that’s as impressive as the vast collection itself! Paul and his daughter riding one of the first Ski Doos. In a later interview with Paul, he told me of the time he and Bottoms took a 1962 Ski-Doo down to the Glenn House for a head-to-head test against Mr. Bob Morrill’s 1962 Arctic Cat series 100. Morrill was the very first snowmobile distributor in New England, distributing Polaris back in 1957. He later dropped Polaris and took on Moto-Ski in 1963. Although his company stayed with Moto-Ski for the remainder of their run, Bob Morrill’s company name was “The Polaris Distributor” of Yarmouth, Maine. At the time of this test, Morrill may have been interested in taking on Arctic Cat and perhaps wanted to see how it stacked up to the Bombardier. Paul stated that it was a cake walk for the nimble Ski-Doo. “We had it all over that Arctic Cat in every situation, from hill climbing, to maneuverability, to all out speed.” “He ended up not taking them on,” Paul laughs. Mr. Paul Dougherty, New Hampshire’s best known game warden and author of the non-fiction book, “Smoke from a thousand campfires,” as well as his weekly column, “The North Woodsman,” (which I loved) was also there taking it all in. Paul was good friends with the Hetteen brothers, Alan and Edgar. He went on many long distance deep woods treks on snowmobiles, with them. They of course were the co-founders of Polaris Industries, where Edgar later left to become founder of Arctic Industries in Thief River Falls, Minnesota. Paul’s other story is a testament to his tenacious work ethic as a young salesman trying to clinch a deal. The large construction firm of Seward Inc. won the contract for running the power line through to Rangeley, Maine back in 1960. Here was a chance to show how well their HDW’s perform in real life situations, he thought. Paul took one over to Rangeley to demonstrate it. He ended up staying for ten straight days in 35 below zero weather, helping them string power line! “I hope they bought it after all that,” I said. “Oh yeah, they bought it all right, but man it was cold,” Paul shivered.